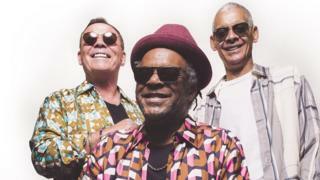 "I'm a reggae anorak," says Ali Campbell, vocalist and founder of UB40. "My whole life, I lived and grew around reggae music. I was devoted to it. I was a bit of a nutter, actually. "It's an obsession that's paid off: UB40 have sold 70 million albums and scored three number one singles over the last four decades. Campbell's love of reggae also inspired the Labour of Love cover albums, which introduced classics like Red, Red Wine and Kingston Town to a new audience.The band have had a turbulent couple of years, which culminated in the eight members splitting into two factions. Ali's brother Duncan now fronts the band known simply as UB40; while the singer himself performs as UB40 Featuring Ali, Astro & Mickey - alongside keyboard player Mickey Virtue and the toaster/percussionist Astro, aka Terence Wilson.The trio's latest album, A Real Labour of Love, entered the charts at number two in March and is among the top 40 best-selling albums of the year. "That's hilarious - or I find it funny, at least," laughs the singer. As the band prepare to play the Coventry leg of BBC Music's Biggest Weekend this Sunday, Campbell reflected on 40 years of success. Reggae was a relatively underground thing in the UK in the 1970s. How did you get into it?I lived in Balsall Heath in South Birmingham which was a predominantly immigrant area. The first generation of Windrush kids were all my friends, and I grew up with Indian and Jamaican friends. So the music of the streets was Indian music, which I love - Mohammad Rafi and Asha Bhosle and all that - and reggae. It was only when I went to secondary school that I realised all my contemporaries were listening to Slade and Marc Bolan - which of course went right over my head.Your dad, Ian Campbell, was a successful folk singer. What did he think of your love of reggae?He was very distraught. He was into traditional folk music - standing up with his finger in his ear and singing unaccompanied. The first time he caught me and a school friend listening to Bob Marley he said, 'What are you doing listening to that gibberish?' I was very offended by that. A bit later on when my friend had gone home, I went into him and said, "Dad, 'Hey willy wallachy, how John Dougal / Alane quo rushety, roo, roo, roo'. Now that's gibberish. "And it was only when his friend, another folk singer called Bob Davenport, sang Get Up, Stand Up that my dad got interested. Still, he must have been proud when you went on to have so much success?No. I think he was bitter and resentful, actually. He was given a lifetime achievement award, and when he went to receive it, he said, "I don't suppose you remember the Ian Campbell folk group. No, of course you don't, because two of my sons started a reggae band and their first single eclipsed my whole 20-year career. "And then he walked off.That's a shame.But, you know, I didn't care. It's the usual father-son thing, I did the exact opposite to what he wanted me to do.I suppose. If your dad approves of your taste in music, you're doing something wrong.I used to think that - but I've got my own sons and daughters now, who all approve of me greatly. They love reggae. But like I said, I think reggae's still relevant.It's the backbone of pop music now.Oh, check it out, man. All contemporary music is influenced by reggae beats. Justin Beiber, Ariana Grande, Rihanna, Beyonce, Pharell Williams - they're all making reggaefied tracks. A Real Labour of Love is a covers album - but are you making new material too?I was in the studio yesterday - just making a little demo. And I've just done a version of Pete Tosh's Legalise It with Fun Lovin' Criminals and Slightly Stoopid. So that's getting a release in America. "All we do when we're on the road is listen to reggae and have nostalgic disco evenings on our bus." Recreational marijuana is legal in nine US states now, isn't it?Oh, it's just wonderful. Touring in America is a different world. You can get medical marijuana in every state basically. That's why we've been going back for the last five years, annually! It's no secret, we've been singing about legalising marijuana for years. A lot of your songs have a political motivation. Do you think that gets overlooked?I made 24 albums before I left my own band 10 years ago. Three of them were cover albums, the other 21 were self-penned. If you look at the music, we actually got angrier as we got older.Songs like One In Ten [about unemployment] and King [about civil rights] are still relevant today. Had you hoped that society would move on?I feel we've gone backwards in England. For UB40, the Rainbow Nation thing that we were all looking forward to didn't happen because hip-hop came along - and along with it came racism and area-code gang warfare stuff and all that. A sort of self-imposed segregation happened, in my eyes. I think we're only just coming out of that now.What's good with reggae is they've dropped the gangster thing. There's a movement in Jamaica now with bands like Raging Fire and artists like Protoge and Chronixx, to move back to conscious lyrics and roots rock reggae. Which we're very happy about.Tell me about playing live… With all of those hit singles, how do you choose what to play?We're not self-indulgent. We wouldn't go out and play stuff people didn't know. So you just get a 90-minute set of all our hits, young and old and fresh and stale.What's the one you look forward to performing every night and what one do you dread?I don't dread any of them! There's none of that, "Oh, Red Red Wine's a millstone around my neck". Because you've got to remember, we did Red Red Wine because we loved the original. And it always goes down brilliantly. Will you be playing She Loves Me Now from A Real Labour Of Love?Of course - that was the lead track! Tell me about covering that song - because Beres Hammond is a legend. It was terrifying because he's one of my heroes. He's the Otis Redding of reggae. But we couldn't do covers from the 80s without including him. He owned the 80s.Has he heard your version?No. I'm terrified of that. I never ask for permission. Are you looking forward to The Biggest Weekend? That's going to be fabbo... if the weather's good. That's the thing about playing outdoors: It can be brilliant or it can be a washout.Especially in the UK on a bank holiday weekend.Exactly! We did one show at Doncaster Castle and halfway through the set we saw bolts of lightning flashing all around the castle. We had to come off because we didn't want to kill the audience.You must always have the Curtis Mayfield tragedy at the back of your mind... [The soul singer was paralysed when scaffolding fell on him during a stormy outdoor show in 1990].Well, yeah. It happens quite a lot. You hear of microphones being hit by lightning; and the scaffolding around the stage is basically a lightning conductor.As a frontman, how do you work up the crowd if they've been soaked?The only thing you can do is stand and perform with them. If they've been respectful enough to wait for you in the pouring rain, I think you have to go out there and share the misery. The show must go on.BBC Music's Biggest Weekend kicks off on Friday, 25 May, with performances from Ed Sheeran, Taylor Swift, Liam Gallgher, Beck, Manic Street Preachers and Paloma Faith. UB40 play the Radio 2 stage in Coventry; and coverage will be screened all weekend on BBC TV, Radio and Online.